...... Frequently, people are downloading identical files from different web sites thus wasting storage space with duplicated content. Overtime, computers tend to collect large amounts of duplicate files scattered over multiple directories or disks with different file names what makes it quite difficult to detect them. 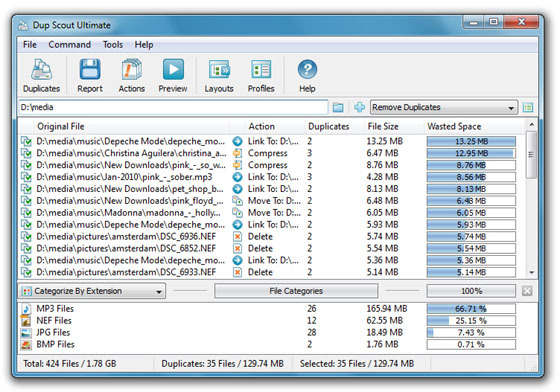 DupScout is a free, fast and easy-to-use duplicate files finder utility allowing one to detect and cleanup duplicate files in disks, network shares and NAS storage devices. The user is provided with the ability to search one or more directories, disks or network shares for duplicate files, select original files that should be kept in place and cleanup duplicates thus freeing up wasted storage space. Qweas is providing links to DupScout 3.6.14 as a courtesy, and makes no representations regarding DupScout or any other applications or any information related thereto. Any questions, complaints or claims regarding this application DupScout 3.6.14 must be directed to the appropriate software vendor. You may click the publisher link of DupScout on the top of this page to get more details about the vendor.